Hey, let’s dishonestly manipulate the results of this Toronto Star poll! Ms. Keesmaat gets her hand caught in the cookie jar. Ooops. Sorry to folks outside Toronto for focussing on her so much lately – but it’s target-rich environment, you might say. All Ward 35/37 Candidates Meeting: Attendee-“Yes thank you, I would like to ask what skills and knowledge and ideas you would bring to the City should you be the successful candidate?”. Attendee-“Oh, right, um, to all the 25 candidates”. Keesmaat’s Mayoral journey will be reminiscent of Gullible’s Travels- Keesmaat the Brobdingnagite and her little Ward 37/35 Lillipitian yes-mam buddy in the land of Houyhnhnm in which they give-up on the Yahoo’s ( that’s us lowly voters ) and spend the rest of their days speaking to their stable horses. Who in their right mind would want two City Planners on Council! TorStar hasn’t had much luck with their polls lately. They did a reader poll recently asking about Ford slashing the size of Toronto council. 70% of respondents were in favour of his plan. Not unusual for supporters of one or both sides of an issue to use social media to ask their followers to vote in online polls. Sure. It’s very common for a supporter of a candidate send out an online poll link and encourage people to hit. 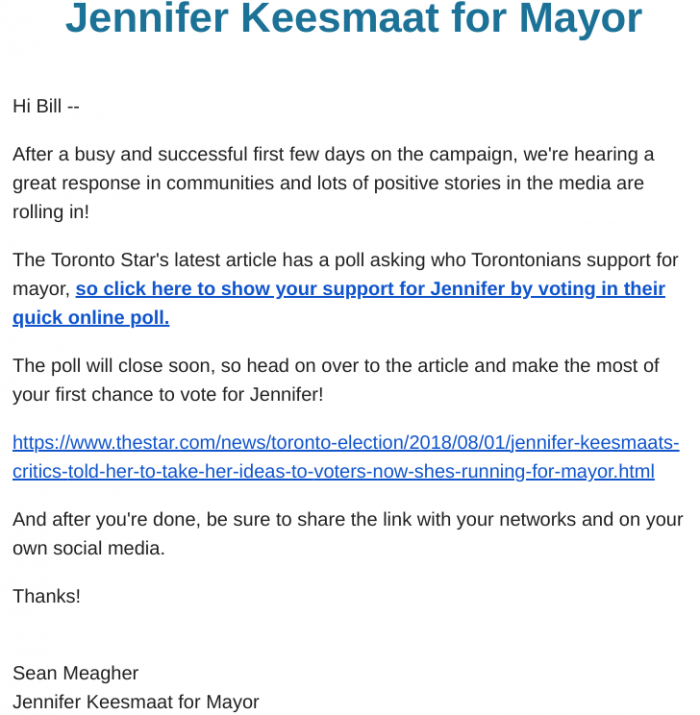 Keesmaat, through her campaign sent out a link to a poll in which she is one of the options asking people to vote for her to manipulate the results in her favour. Still not seeing the difference. So, apparently Jennifer Keesmaat was the Downtown Dippers third choice in trying to get someone to run for Toronto Mayor fearing they would lose their control of council after Fords cut announcement. “Sources say the offer first went to Mike Layton, son of the late NDP leader Jack, to take on Tory. The phone lines and Twitter feeds were also buzzing between the NDP contingent on council and former Toronto mayor David Miller. He also said no, probably knowing that would be a suicide mission considering how many bridges he burned before he left office. That brought them to Jennifer Keesmaat, former chief planner and darling of the CBC Birkenstock/bike set. Councillors Sarah Doucette, Mike Layton, Joe Cressy, Gord Perks, Kristyn Wong-Tam, and Joe Mihevc. Council staffers: Elli Stephanie Nakitsas (works for Layton); Christopher Haskim (Doucette); Marco Bianchi (Layton); Brent Gilliard (Cressy); Karen Duffy (Perks); Lia Brewer (Cressy) ; Joan Wilson (Cressy); Clive Scott (Perks); Lisa Hoffman (Wong-Tam); Katherine Trimble (Doucette); Andrea Fresolone (Doucette). This sounds plausible and I don’t see anything wrong with it. Running against John Tory and losing would still be a very effective profile raising exercise and opens the door to future successes. It worked out pretty well for that guy, John Tory. Is this any different than GOTV efforts, except less important?